I am a clarinettist, saxophonist and music teacher. I studied at Ingesund College of Music, Sweden, and after completing my studies there I have continued my clarinet studies in the form of private lessons with many eminent teachers including Kjell Inge Stevensson and Lars Gunnar Wåhlstedt, who have both been inspirational teachers. To name two people who have provided me with great support and inspiration in my saxophone studies I would like to especially thank Anders Paulsson and Frank Timpe for their guidance. In addition I have also studied conducting at SMI and on summer courses with Sigfried Naumann. Since completing my studies I have worked as a clarinet and saxophone teacher and freelance musician. 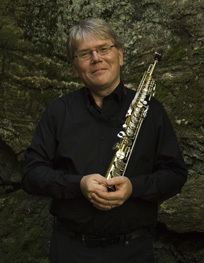 My freelance career as a clarinettist has included work for Värmland Sinfonietta and work as a soloist and chamber musician in a variety of ensembles and contexts. I have performed on several radio and c.d recordings, and played in several different jazz ensembles, big bands and folk music groups. I have been a member of the Arvika-based ensemble "Södra Åkeriet" for many years. for many years. I have had several compositions dedicated to me including a soprano saxophone concerto by Mats Edén which I premiered together with Musica Vitae in the spring of 2011. Another interesting work is the ''Three Part Invention'' written by Peter Bjuhr which I performed with Malmö Chamber Orchestra, and the piece by Micaela Hoppes ''Till Klarhet''. I am the soprano saxophonist with the saxophone quartet ''Con Spirare'' and I offer a variety of concert programs for soprano saxophone with piano, organ or string quartet. You are welcome to listen to some musical examples of my performances!